- Airline maintains its technological leadership with latest initiative. - ANA incorporates advanced technological solutions developed by NEC to continue setting the standard for in-flight service. 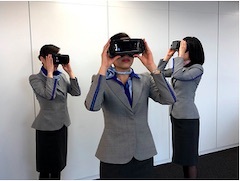 TOKYO, Mar, 21 2019 - (JCN Newswire) - All Nippon Airways (ANA), Japan's largest and 5-star airline for six consecutive years, has begun using the latest virtual reality (VR) technology developed by NEC Corporation (NEC) to provide enhanced safety training to flight attendants. Already widely recognized as a global standard bearer for in-flight service, ANA is moving to update its training with the latest technology to ensure that all flight attendants are prepared for a wide range of in-flight scenarios. ANA has a history of technological innovation, and the use of VR to replicate a range of emergency scenarios will prepare flight attendants to respond quickly and effectively in the event of a crisis. The entire VR program is part of a collaboration with NEC to provide an immersive and dynamic training environment that encourages flight attendants to think quickly and creatively. "VR opens the doors to emergency training scenarios that we were previously unable to address in an interactive manner due to safety concerns,'" said Hitomi Yamamoto, Executive Vice President of ANA. "Instead of learning how to address these situations from a textbook in the classroom, flight attendants will be able to combat dangers in real time through accurate VR recreations. ANA has a legacy of prioritizing customer safety and innovation, and this new generation of VR training will allow us to continue our leadership in both of these spaces." ANA first began to use this advanced training system in 2018, and all 800 new flight attendants received VR training in the program's three distinct scenarios: internal cabin fire, sudden depressurization and in-flight equipment check. enjoy brighter and more enriched lives." The VR training is an important first step in ANA's partnership with NEC to build a "Virtual Work Place" that will streamline the future of work. This cutting-edge working environment utilizes VR to eliminate limits on time and space while also allowing humans and AI to work together. Going forward, ANA will continue exploring ways to harness the power of VR in order to improve service and heighten connections. Following the "Inspiration of Japan" high quality of service, ANA has been awarded the respected 5-Star rating every year since 2013 from SKYTRAX. ANA is the only Japanese airline to win this prestigious designation six years in a row. Additionally, ANA has been recognized by Air Transport World as "Airline of the Year" three times in the past 10 years - 2007, 2013 and 2018, becoming one of the few airlines winning this prestigious award for multiple times. Besides the full service and award winner carrier ANA, the ANA Group has two LCCs as consolidated subsidiaries, Vanilla Air Inc. and Peach Aviation Limited. The ANA Group carried 53.8 million passengers in FY2017, has approximately 39,000 employees and a fleet of 260 aircraft. ANA is a proud launch customer and the biggest operator of the Boeing 787 Dreamliner. For more information, please visit, https://www.ana.co.jp/group/en/.